According to a Pew Research Center survey 18% of US social media users have changed their profile picture to raise awareness or draw attention to an event or issue. Most of those that have changed their profile picture have done it to show solidarity with the LGBT community and support LGBT rights. Social media is a great way to make companies aware of the social causes you support but an even better way to make a difference and show your support for a social cause is by becoming a socially conscious investor and investing in socially responsible companies. Being a socially conscious investor means that you are investing for more than just monetary returns, you are investing to make what you consider a positive difference in the world. That positive difference could be preserving the environment by reducing emissions, promoting diversity in the workplace, or even encouraging equal pay for both genders. Socially responsible companies believe that doing good business is about more than increasing their profit margin, it’s about changing the world for the better by giving back to the community and treating their employees with high regard. When you invest in socially responsible companies you invest in companies that align with your ideals and you encourage good corporate behavior by becoming a shareholder to show that you believe in their vision. If you want to start investing in socially responsible companies, the following 5 ETFs are a good place to start doing your research. This is a new ETF that invests in companies that are leaders in advancing women through gender diversity on their boards of directors and in management. If you want to show your support for equal pay between genders and corporate diversity this may be an ETF that is worth looking into. With a .20% expense ratio it’s not a very expense ETF and according to Zacks Investment Research the ETF has had a successful launch generating about $264.2 million of assets since its debut. 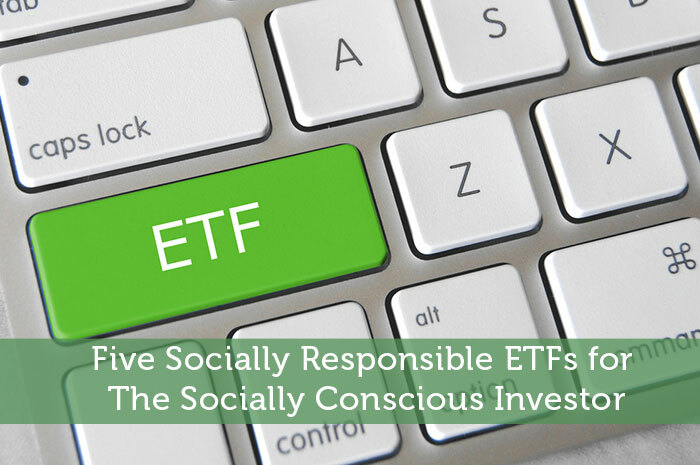 This is one of the first socially responsible ETF’s having been around since 2006. This ETF invests in US companies that have positive environmental, social and governance characteristics as identified by the MSCI KLD 400 Social Index. With $494.5 million in net assets this is the largest socially responsible ETF however it’s a little expensive with a net expense ratio of .50%. This is a fairly new ETF that debuted in 2014. This ETF invests in global companies with a lower carbon exposure, including carbon emission and potential carbon emissions from fossil fuel reserves, than that of the broader market. It is believed that lowering carbon emissions is extremely important to preserve our environment and combat global warming therefore if that is a cause that is important to you, this may be an ETF worth looking at. The ETF has a fairly inexpensive net expense ratio of .20% and currently has $221.3 million in net assets. This is an older ETF that was incepted in 2005. This ETF invests in US companies that have positive environmental, social and governance characteristics (“ESG”). If you are against tobacco companies then this may be the ETF for you. It doesn’t invest in any tobacco companies and largely focuses on financials, healthcare and information technology companies. It has $357.8 million in net assets and a net expense ratio of .50%. This is a newer ETF that was incepted in late 2015. This ETF invests in companies in the S&P 500 that are “fossil fuel free” meaning the company doesn’t own any fossil fuel reserves. Fossil fuels are considered important to preserving our environment therefore if environment protection is an import cause to you, then this is an ETF worth researching. This ETF is a smaller one with only $71.8 million in net assets however it is a lower cost ETF at .20% net expense ratio. This author has no positions in any investment mentioned and does not plan to open any positions in any investments mentioned for at least 72 hours after publication of this article. All investments mentioned general and not specific investment recommendations.